Sossusvlei is in Namibia, an extremely arid country, located on the Atlantic coast of Africa, just north of South Africa, west of Botswana, and south of Angola. Sossusvlei means “dead-end marsh,” so named because there is no outflow for the Tsauchab River, which flows there occasionally. Namibia is one of the most civilized of all the African countries. It has a democratically elected president and a constitution that codifies some incredible environmental regulations. There’s very little litter and the country is quite well maintained. People are generally friendly, especially in smaller towns and in the rural areas. Since Sossusvlei is one of the most popular destinations in Namibia, tour operators and travel agencies in Windhoek (the capital) conduct tours there daily. 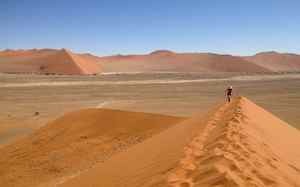 It is in the Namib Naukluft desert and home to some of the highest sand dunes in the world. Due to atmospheric conditions and the high iron content in the sand, the sand oxidizes to a pink to orange-ish color. The oldest sands are of a deeper reddish color. Big Daddy (365 meters — around 1,200 feet high) and Big Mama (slightly smaller) are located there. 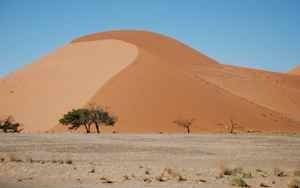 Big Daddy is the highest dune in the Sossusvlei area. It is the height of a 120-story building. There are scores of other dunes of various sizes and they are fun to climb — and then run down! Just be sure to carry water with you as you will definitely need it. This is an area where rivers are usually dry… but when they run (the last rain in this area was in 2011, and previously, in 2006) sharptooth catfish magically appear from deep in the sands to live again (or so local guides say…). Evidently these fish can survive for long periods of time awaiting the next downpour. It’s so dry that the manager in one resort stated that he had taken his 6-year-old son on a picnic by a river that had water in it, and his son told him that this was not a river, as rivers did not have water in them. In his short life he had never seen a river with water in it! That’s how rare rainfall is in the Namib desert. Atlantic Ocean coastal fog drifts roughly 30 miles inland to provide a meager source of moisture to the area and helps preserve dune vegetation and enable tiny animals to live without water for long periods. The Namib desert beetles harvest water from the morning coastal fog by trapping it in bumps on their backs. They then lift their hind legs and the water flows down them into their mouths. Rather ingenious. 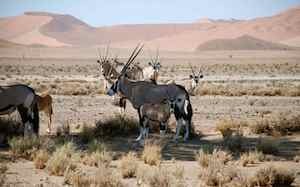 It’s not unusual to see oryxes, impalas, springbok, jackals, ostriches, and zebras as you drive the area. At night, the sky is a wonder to behold. Sossusvlei is reputed to be the least light-polluted area in the world. The sky contains a million stars and all are highly visible! The Milky Way is enormous and very easy to distinguish. Since this is the southern hemisphere you can see the Southern Cross but not the Big Dipper. The dunes may look familiar as Sossusvlei is one of the most photographed places in Sub-Saharan Africa due to its surrealistic landscapes. Movies (such as “The Cell”), commercials, and music videos have been filmed there. If you go: Sossusvlei Lodge Adventure Centre can arrange for you to take scenic flights and guided tours or go hot air ballooning or quad biking. Or you can simply enjoy the beautiful, clear skies and serenity. For additional information: www.sossusvleilodge.com or email adventure@sossusvleilodge.com.